FC Barcelona Goes into the 2nd Leg as slight favorite courtesy of the away goal and home advantage. FC Barcelona will be hosting the second leg of Copa Del Rey 2012-13 semi-final against arch-rivals Real Madrid on Tuesday night at the Camp Nou. As you all already knew, the first leg ended in another Real Madrid - Barca stalemate with each sides scoring one each.Now in any normal season, coming from your fierce opponent's den with an away goal and a draw will be considered as a very good result. But then this ain't a normal season. This season we could not help ourselves from conceding at least one goal in every match. There is a total sense of helplessness when we concede every match. So suddenly a 1-1 result which was very much in our favor, looks like a 2-1 in their favor. So suddenly this has become a must win match. But on a positive note, Real Madrid's away form has not been any great this season. Hence we may come back to the old 1-1 situation. Regardless of our defensive fragility, the fact that the first leg ended on 1-1, Real Madrid may be forced to come out and chase the game. If that happens it should be a very open game. FC Barcelona are facing a rather surprising Champions League exit after going down 2-0 down at the San Siro against AC Milan. On the paper this was a complete mismatch with us flying and Milan struggling to find their foot. But on the field the roles were reversed. We were absolutely clueless and created nothing for all the possession we had. It was inevitable considering our defensive record that we will conceded at least one goal, but the second goal and lack of away goal effectively has sealed the tie. We now face a daunting task of reversing the scoreline, but going by our recent performances against defensively minded team it's going to be a really uphill task. We were unlucky to concede the first goal as their was a clear handball which directed the ball to eventual scorer Boetang's path. But before and after the goal we had done nothing to take anything away from the game. Roura went with a very much expected line-up - Valdes, Alves, Puyol, Pique, Alba, Xavi. Busquets, Cesc, Pedro, Messi and Iniesta. The Milan line-up was Abbiati, Abate, Mexes, Zapata, Constant, Montolivo, Ambrosini, Muntari, Boaetang, Pazzini and El Shaaraway. FC Barcelona will be travelling to Milan to face AC Milan in the first leg of Champions League pre-quarter of this season. The match will be held on Wednesday and the squad which will travel to Milan has already been announced. The notable absentees are Adriano and Villa, both recovering from their recent injuries and illness. The full squad list is Valdés, Pinto, Oier, Alves, Piqué, Fàbregas, Puyol, Xavi, Iniesta, Alexis, Messi, Thiago, Mascherano, Bartra, Sergio, Pedro, Jordi Alba, Montoya, Song and Tello. The good news is that Xavi has been given the all clear from the medical staff and may even start the match at San Siro stadium. Barca faced AC Milan four times last season, winning two and drawing the other two. Compared to last season, this Milan side is a well depleted force - with Ibrahimovic, Thiago Silva and Nesta being notable absentees. The widely held consensus among football pundits is that we may find it much easier this time with our visit to Milan. 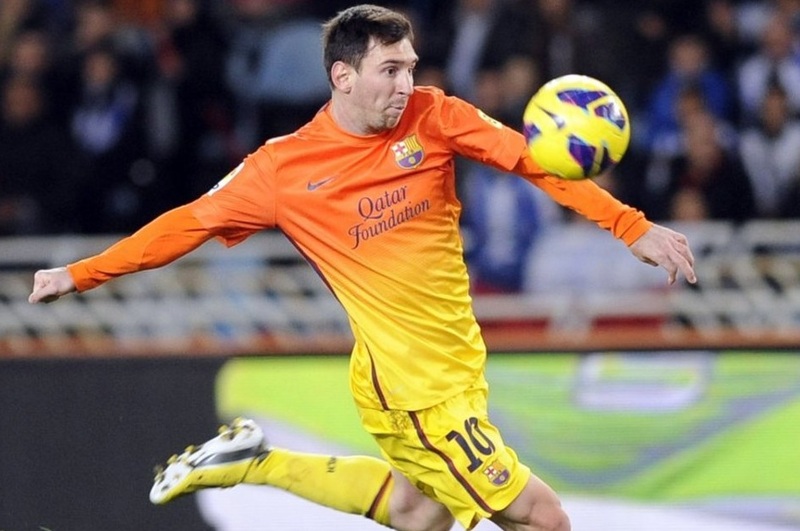 Lionel Messi scored twice, the second from an excellent free kick worth a watch. Ok, this is the story of this match. In the absence of Xavi and Iniesta, Messi decided to play the play-maker role in the first half. He was doing brilliantly in that, but Alexis & co. were finding innovative ways to waste simple chances. So come the break, he decided to take the scoring task also on him - scored the equaliser in a tru centre forward fashion and scored the winner with a exquisite free kick, which left teh Granada keeper tranquilized. End of the story. In winning us the match Messi achieved yet another milestone(something he is doing so regularly, that people don't care for much) - he has scored 301 goal for Barca with this twin strike. Looking forward to the visit to Milan a number of players started from bench. The defense had Alves, Pique, Mascherano and Adriano. The midfield as expected was made of Thiago, Fabregas and Busquets. Pedro, Messi and Sanchez made the front line. FC Barcelona will be entering a hectic tight packed schedule with the scheduled visit to Granada in the league this Saturday. First it will be a visit to Granada followed by a visit to Milan, then hosting Sevilla at home and after that the much anticipated double header with fierce rival - Real Madrid(first in the Copa and then in the league). Considering the tough matches coming ahead, everyone could expect the likes of Messi, Iniesta etc being rested for the visit to Andalusia. But I doubt so, at least in the case of Liuonel Messi. Messi has been scoring goals for fun this season, and an absence from one match is not going to hurt him. But this one he is not going to be rested, or atleast he will not allow the Manager to do that. Lionel Messi has scored against all La Liga opponents other than Granada, Sevilla and Celta this season. So that's a heck of a motivation for him to play. Consider to the other opponents whom we have to face very soon, Granada appears to be a much easier task. But the Real Madrid also thought the same two weeks back, Granada - 1, Madrid - 0 and paid the price.